In 1911, Peyton Rous discovered that the (Rous) sarcoma virus (RSV), an oncogenic virus, could cause cancer in chickens. This finding, the first to show that a virus could cause cancer in any species, was finally recognized by the Nobel Committee over fifty years later, in 1963, when Rous was eight-four years old. RSV was later found to be a retrovirus that contains RNA instead of DNA and can be transcribed into DNA by the enzyme reverse transcriptase, which is present in the virus. The abnormal DNA can enter the chromosomes of normal cells and redirect their activity, resulting in cancer. In 1976, Michael Bishop and Harold Varmus at the University of California, San Francisco, used RSV to demonstrate how malignant tumors are formed from normal cell genes. Oncogenes refer to specific parts of the genetic material of viruses that can direct the transformation of a normal cell into a cancer cell, when influenced by other parts of the virus or by radiation or certain chemicals. They found that the oncogene in RSV was not a true viral gene but rather a normal cell gene—a proto-oncogene—that the virus had acquired during replication in the host cell and carried along. Proto-oncogenes are genes that code for (send instructions for synthesis of) a kinase enzyme, which triggers signals that stimulate normal cell growth and division. The Bishop-Varmus discovery has led to the isolation of many cellular genes that normally control growth and development but that can become mutated, causing cancer. During the cell cycle, damaged DNA in genes is normally repaired or destroyed. If such repair-destruction mechanisms are inadequate, mutations build up and genetic damage is passed on to the daughter cells. Cancers arise when normal cells in the body suffer an irreversible change in their genetic material. Two classes of genes regulate the growth of cells: proto-oncogenes and tumor suppressor genes (TSG), mutations in either of which might potentially result in cancer. Mutations in proto-oncogenes may result in overstimulation and uncontrolled cell growth while mutations in TSG may remove the brakes that control cell growth. SEE ALSO: Viruses (1898), Cancer-Causing Viruses (1911), Bacterial Genetics (1946), Central Dogma of Molecular Biology (1958), HIV and AIDS (1983). 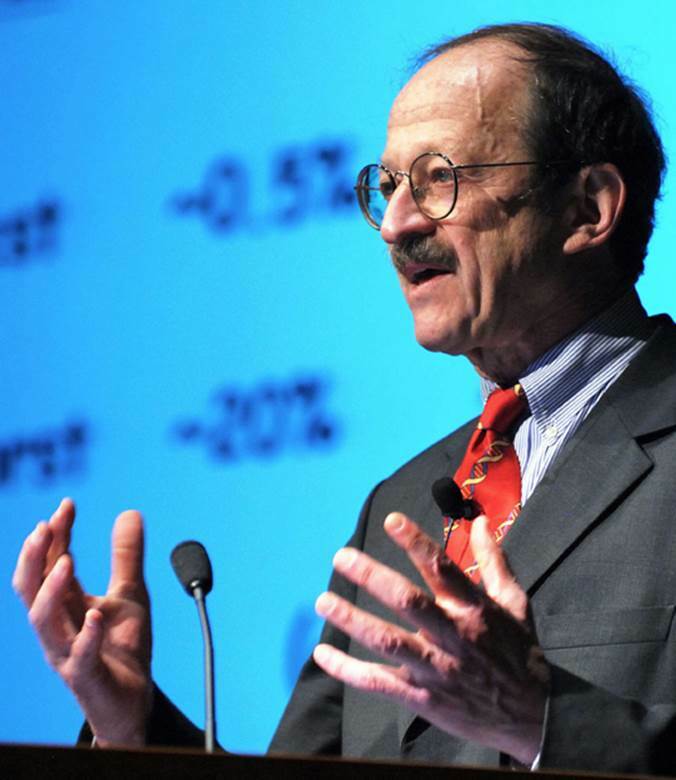 In this photograph, National Cancer Institute director Harold Varmus—co-recipient of the 1989 Nobel Prize for demonstrating how oncogenes in viruses can cause cancers—gives a presentation in 2010.